Today, in a fit of nostalgia I went to googled up some of the older TV shows I use to watch when I was a kid. Apparently, one of my favourite childhood shows (and one I still adore today) was actually a Japanese cartoon...and here I thought my first contact with Japanese animation was Sailor Moon. The Littl' Bits (official site), according to Wikipedia was "... a Japanese anime television series with 26 episodes, produced in 1980 by Tatsunoko Productions in Japan. First shown on TV Tokyo, its Saban-produced English translation was featured on the children's television station Nick Jr. from 1991 to 1995...". Hurrah! I love on Littl' Bits. 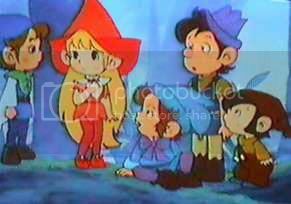 The Grimm's Fairy Tale Classics that was shown on Nick Jr. around the same time is actually an anime as well. Clearly, Nick Jr. was secretly trying to train its viewers at a young age.